Contemporary Turkish improv-psych-folk-rock group Hayvanlar Alemi have been a favorite discovery for many Free Music Archive members, myself included. I've written previously about how the group is inspired by the global psychedelic awakening of the 60s and 70s that blossomed pretty much everywhere from America to Zambia to Cambodia to India to their home country of Turkey (where artists like Selda Bagcan and Ersen are possibly my favorites of this entire era). The Sublime Frequencies label, founded by Alan Bishop (Sun City Girls) and Hisham Mayet, has done incredible work shedding light on traditional music and psychedelic sounds from around the world, including those from previous decades (Cambodian Cassette Archives, 1970's Algerian Proto-Rai Underground, The Vinyl Warp of Latin American Psychedelia) and a transportive sound-collage series (i.e. Radio India, Radio Thailand, Radio Java, Radio Morocco). Meanwhile, contemporary artists like Syrian debke legend Omar Souleyman and the Western Saraha guitar sounds of Group Doueh have found international recognition and toured the globe thanks to Sublime Frequencies' support. The label is known for presenting these types of prolific artists (Omar Souleyman is said to have released over 500 cassettes!) through well-curated slices of sound. Many of these sublime sounds have undoubtedly been an inspiration to Hayvanlar Alemi's music, so it's fantastic news that Sublime Frequencies is issuing their first-ever vinyl LP Guarana Superpower. 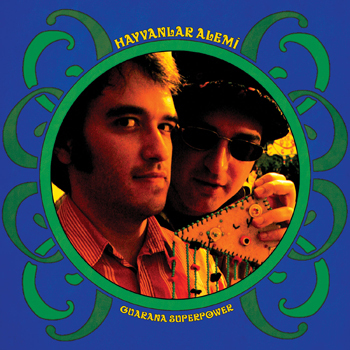 We just received a promo copy here at WFMU, and Guarana Superpower is a helluva record that includes reworked versions of a few tunes that were first heard on Hayvanlar's many free mp3 releases Demolar (which our friend Olgu introduced to WFMU way back in its CD-R format -- thanks Olgu!). Enjoy the Demolar version of these tracks, and you can pick up Hayvanlar Alemi's Guarana Superpower LP here.